MONTAUK IS SURROUNDED BY WATER, AND TRAILS…THAT MEANDER THROUGH ACRES OF UNSPOILED PARKS THAT SERVE US AND OUR WILDLIFE. White-tailed deer, foxes, raccoons, woodchucks, squirrels, opossums, and chipmunks abound. Watch for deer while driving! Rare and majestic birds also frequent the End. You may spot an osprey, red-tailed hawk, piping plover, or even a bald eagle. Sizable concentrations of migrating birds rest in the waters off Montauk Point while seals inhabit our rocky shores during the winter months. Gannets torpedo into the ocean in fall seeking baitfish. You get the picture…you’re in a natural paradise. Trail Maps are available at the Montauk Bike Shop and the Town Hall Annex in the Montauk Playhouse. Buy a trail map. Although major trails are marked, many divergent ones are not. Leaf cover can mask trails, causing confusion. Also, after heavy rains some trails may be muddy or inundated. The Montauk Bike Shop has maps and information. Avoid Ticks: Experts recommend to stay on trails, wear light colors, be well covered, and use insect repellent. Ticks tend to congregate on tall grasses, so avoid such areas. After you walk or bike, check everyone for ticks, particularly tiny deer ticks, which may carry Lyme disease. A 200-acre park stretching from Ranch Road at Indian Field on the east to the Montauk Association houses (seven cottages designed by McKim, Mead and White in the 1880’s) to the west extends southward to the Atlantic Ocean. The natural topography, called “Montauk Moorlands,” has tidal and freshwater wetlands interspersed throughout maritime shrub lands. This main trail head on Montauk Highway begins a one-mile hike to the ocean bluffs taking you through a holly arbor and across streams. The hilly trail affords peeks of ocean through the brambles and ends at the ocean beach and bluffs. This easy-to-navigate trail offers a unique reward of coastal beauty. A great hike to an unspoiled beach. This 415-acre state park is a decommissioned military base and a National Historic Site (also the home of conspiracy theories linked to the Philadelphia project). Several buildings, bunkers, batteries, and an old radar building remain, although some are off limits to the public. Roads cross the park, along with an extensive system of trails for hiking, bicycling, horseback riding, a beach used by surfers and surfcasters, a picnic area with grills and an old maritime forest. To enter the park, bear right as you approach the lighthouse from the highway. Parking fee $8 in season. Open daily year-round from sunrise to sunset. You can also park on Camp Hero Road (a right turn before Camp Hero along the highway) to hike Point Woods Trail, one of Montauk’s most beautiful trails, taking you south of the highway to the bluffs. This park is named after the HMS Culloden, a British 74-gun, 170-ft warship that sank in 1781 about 200 yards from shore, where it still rests. A well-marked trail that takes about 2 hours to loop (a mile or less to the shoreline) leads from the parking area off Flamingo Avenue to a picturesque rocky beach on Fort Pond Bay. The trailhead is next to a small plaque commemorating the shipwreck. The natural wooded area and shoreline has seen little change from the days when the Montauketts lived here in a world of hidden ponds, specimen trees, wetlands and beautiful shoreline. Great views of the bluffs at Culloden Point. Located at the end of Navy Road (across the train tracks), the large, open park has a fishing pier, rocky beach and offers easy access to trails in Hither Woods Preserve. A good place for launching kayaks and canoes into Fort Pond Bay. Take your dogs to play. Open year round. Free parking. Carol Morrison Park, containing Fort Pond House, is located on a four-acre site overlooking Fort Pond with a grill station, benches, and open space for play. Steps down to the pond allow for launching kayaks, etc. Carol Morrison was a well-loved conservationist and it is appropriate that this park, which narrowly escaped being sold to private developers in 2010, should be named after her. The house on the premises is available for meetings and other events by appointment through the East Hampton Recreation Department, 631-324-2417. 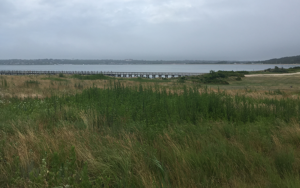 The large beachfront park along Old Montauk Highway sits on two-and-a-half-miles of Atlantic Ocean beach and boasts 1,755 acres of parkland that stretches to Napeague Harbor. Along with hiking and nature trails, it has 168 campsites that can be reserved through ReserveAmerica.com.Activities include ocean swimming, saltwater fishing, guided nature hikes, and children’s programs. Non-campers are welcome, but must pay a $10 daily parking fee. Open year round from sunrise to sunset. (631-668-2554). Hither Hills State Park, Hither Woods Preserve and Lee Koppelman Nature Preserve form adjacent multi–use parks containing 3,000 acres with 18 different trails covering over 40 miles of terrain stretching from the sound to the Atlantic. To access the trails north of the highway, park at either the highway overlook at Hither Woods, the recycling center (1.5 miles west of the village on Montauk Highway), or at the Navy Road (Eddie Ecker Park) parking lot. The Montauk Bike Shopin the village arranges group and corporate tours, rents mountain bikes, and gives advice. Bike or hike to Fresh Pond or take a beautiful coastal walk at Rocky Point. Even though the trails are blazed with color-coded markers, hikers should take maps. Attractions: Fresh Pond; trails skirting Block Island Sound, Napeague beach, and dunes. This quaint three-acre park, just west of the village, is maintained by the Montauk Village Association. It includes Fort Pond, which is the second largest freshwater lake on Long Island, a picnic area, a pavilion on Fort Pond, and it’s next to Second House Museum and Montauk Indian Museum. The park hosts events year-round. A 160-acre park that has an 18-hole public golf course (see Landsports). It also has a driving range, a putting green, and six Har-True tennis courts. A large outdoor pool and a wading pool for children is open in summer. Montauk Mountain Preserve contains one of the few remaining maritime grasslands in New York and supports some of the state’s rarest plants. It contains three extremely rare denizens of this distinctive and disappearing habitat: bushy rockrose, Nantucket shadbush, and New England blazing star. DO NOT TOUCH OR DISTURB these specimens. The six-acre preserve is maintained by the Nature Conservancy. To get there, follow Second House Road north 0.7 miles to an asphalt road on the left. Park at the end of the asphalt road by the Nature Conservancy sign. The preserve is at the end of the road past the last house on the right. This 724-acre park at the site of the Montauk Point Lighthouse offers breathtaking views of the sea, Block Island Sound, and Block Island to the northeast, and is great for bird watching year round and seal watching in winter. Park then set off on foot to explore. Ask for a trail map at the toll booth. 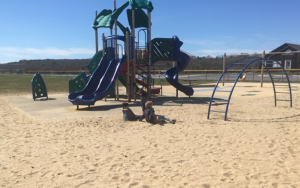 The park has surfcasting, five miles of marked and unmarked hiking trails, a picnic area with tables, a playground, restaurant, gift shop, and restrooms. Daily parking is $8. The Montauk Point Lighthouse, a museum run by the Montauk Historical Society, is open daily in season. This park is contiguous with Camp Hero Park and the Sanctuary and there are several hiking trails that cross them. To the north of Montauk Highway, look for signs for Money Pond Trail, Oyster Pond trail and the Seal Haul Out Trail, where seals can be seen on the rocks just off shore in winter. Attractions: beautiful rugged shorelines, migrating birds, hidden ponds, seals in the winter. Also see WALKING DUNES. Located two miles east of the village on Montauk Highway, this 99-acre tract of land has a half mile of ocean frontage where tall clay cliffs plunge down to a pebble strewn beach. About 30 percent of Shadmoor is freshwater wetlands with several small ponds hidden in the thickets. Trails and dirt roads lead to the bluffs from the entrance on Montauk Highway, offering an easy walk. A passive-use park, Shadmoor was home to two WWII gun emplacement sites trained on offshore waters to deter German submarines. A good family hike. Attractions: dramatic vistas of Montauk shoreline, easy hike. Two entrances: one at the end of East Lake Drive just north of the airport, where the park office is located, and the other at Third House, three miles east of the village on Montauk Highway. The park’s 1,126 acres feature 3.5 miles of color coded nature trails restricted for hiking (a self-guided brochure is available), five miles of bridle paths, a picnic area, freshwater fishing and canoeing at Big Reed Pond, and surfcasting on the outer beach (Gin Beach and Shagwong Point). Camping is permitted for up to seven days from April through November on the outer beach for vehicles with permits that are self-contained trailers. Tents are not allowed. The view of Big Reed Pond from the observation deck on the blue trail will make you understand why it’s a Registered Natural Landmark. Attractions: hiking, views, fishing, camping. Part of Hither Hills State Park on the east side of Napeague Harbor, the Walking Dunes reach a height of 80 feet as they slowly move southeast. To get to the dunes, head west on Montauk Highway and turn right at Napeague Harbor Road and drive to the end of the paved road. Park here and follow the path to your right until you reach the dunes. A self-guided nature trail, the three mile loop has great views of Napeague Harbor and winds atop the ridge of the North Dune, which is the most active of the three parabolic, or U-shaped dunes. This area is a natural wonder and deceptively fragile so stay on the trails. Attractions: 80-foot high sand dunes, water birds, views of Napeague Harbor. The East Hampton Trails Preservation Society conducts guided hikes year-round. Check outehtps.orgfor details. 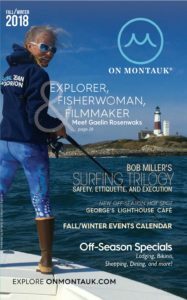 The Concerned Citizens of Montauk, 631-238-5720, preservemontauk.org, offer outdoor activities throughout the year. Drop by their office at 6 South Elmwood Avenue for advice or maps. The East Hampton Trails Preservation Society conducts guided hikes year-round of Montauk’s trails. Go to their web site: ehtps.org, for hike schedules, usually held on Saturdays. The Concerned Citizens of Montauk, 631-238-5720, offer outdoor activities throughout the year. Drop by their office at 6 South Elmwood Avenue in the village for advice or maps; it’s your walk-in resource to everything outdoors. ccom-montauk.org. Conducts guided hikes year round of Montauk’s trails. Go to their web site for hike schedules, usually held on Wednesdays and Saturdays. Offer free hikes guided by naturalists and other outdoor activities throughout the year. Drop by their new office at 6 South Elmwood Avenue in the Village for advice or maps. It’s your walk-in resource to everything outdoors.